One of the pieces in the show: A matrix of recent family and high-school senior portraits. I’ve got another show at Sweetwaters (on W. Washington). Hooray! 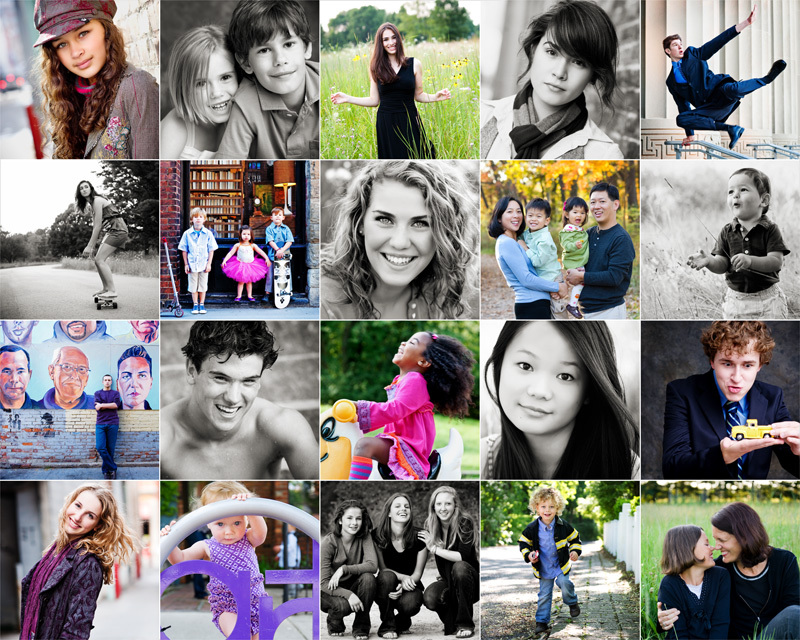 It includes portraits I’ve taken of children and high-school seniors living in the Ann Arbor area. Perhaps you’ll recognize one of your friends or neighbors, or even yourself. I even brought back a few pieces from my first Sweetwaters show in 2007 — for old time’s sake, and because, frankly, I still really love them. And I’ve added some of the community photography I’ve provided pro bono to local arts and human services organizations. These include images for FestiFools, Pioneer Theatre Guild, the Burns Park Players, Make-A-Wish Foundation of Michigan, and Ozone House. I’ve been working on getting this show up at Sweetwaters nearly every day since March 31. Normally, it shouldn’t take 11 days to install a show that will only be up for a month! But, in my defense, there have been unexpected benefits to dragging out the process. Each time I came to Sweetwaters to add, fix, or tweak something, I got to visit with several people whom I was delighted to see (or in several cases, meet for the very first time). I’d say that, on average, for every 5 minutes of actual adding/fixing/tweaking, there would be at least 15 minutes of wonderful conversation to follow. Another advantage of working on the display so much is that my presence seems to have invited questions about the community organizations I’ve worked with. Just yesterday, two separate Sweetwaters patrons asked me about the exhibited Ozone House posters. The more they learned about Ozone House’s inspiring mission, the more they wanted to learn. People at another table were curious about Make-A-Wish, so I got to tell them about the amazing work that goes on there. (Meta-factoid: it was actually because of my 2007 show at Sweetwaters that Make-A-Wish Michigan’s graphic designer Robin Cook first saw my photography and invited me to work with that organization.) And I noticed several children excited about the “Cat in the Hat” publicity photo I did for the Pioneer Theatre Guild’s upcoming production of Seussical — well, you can imagine how much I loved telling them that that musical opens in less than two weeks! Part of a series of Ozone House posters designed by Pryor Design. 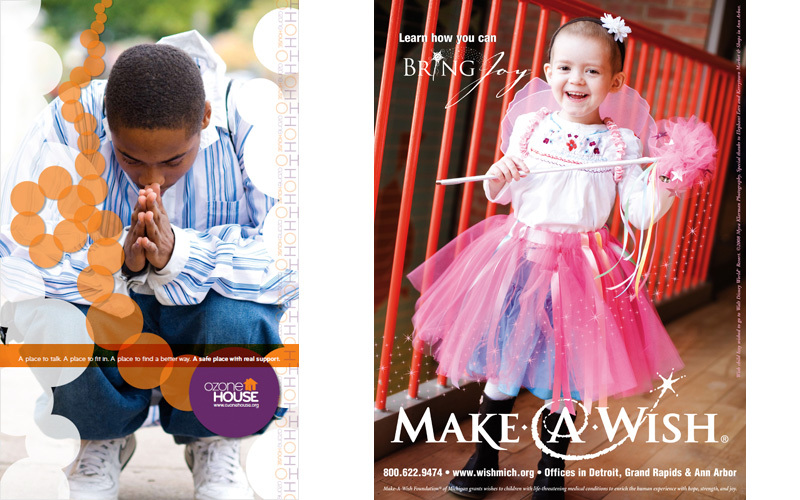 | A Make-A-Wish advertisement featuring Wish-Kid Izzy by Whitfield Design. My show is now fully up — placards, artist statement, and all. But I still come in every day (ostensibly) to straighten any pieces that may have even the slightest, barely detectable tilt. Of course, my real reason for regularly visiting Sweetwaters is so I can have more of these serendipitous meetings and gratifying conversations. And, now that the weather is finally warming up, I don’t mind if I enjoy an iced ginger lemon tea, too! I hope you’ll have the chance to see the exhibit at Sweetwaters before I take it down on the evening of May 1. We may even run into each other there. Major thanks to the following folks, who generously either lent physical pieces for this exhibit or provided me with digital artwork featuring my photography: Scott Pryor (Pryor Design Company), Robin Cook (Whitfield Design), Mark Tucker (FestiFools), Katie Doyle (Ozone House), Mysti Plummer (Pioneer Theatre Guild), and Liam White (designer, Oliver! poster). April 18–June 13: Several of my large-scale images taken at the 2009 Ann Arbor Summer Festival will be on display in the University of Michigan Hospital main lobby. June 18–July 8: An exhibit of ALL NEW Summer Festival images (taken during the 2010 season) will be on display at the Power Center. I was in the UM Hospital the other day and I looked over and said “AH! Myra’s here!” It made my day, my friend, to see your beautiful work up for all to see. We need a little diversion in such a place and your bright colors and smiling eyes take us away for just a bit from whatever it is that brought us there. Love to you!